Norah Pam first came to Spitalfields in August 1931 and this week she made a return visit, just to see how things were ticking over in her old neighbourhood eighty years later. 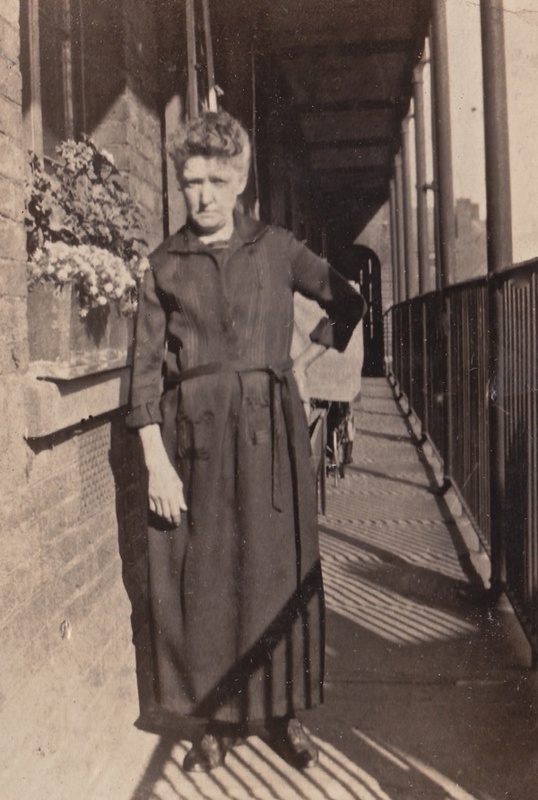 Here you can see her standing outside 11 Victoria Cottages, where her great-grandparents Lewis Carr, a silk dyer, and his wife Louisa came to live with their three children, shortly after the terrace was built in the 1860s. Norah was delighted to see that the gardens are well kept – just as she remembers them in her childhood in the 1930s. By 1881, the family had moved to the flats at the rear of the cottages, known as Albert Family Dwellings and it was there that Norah grew up. 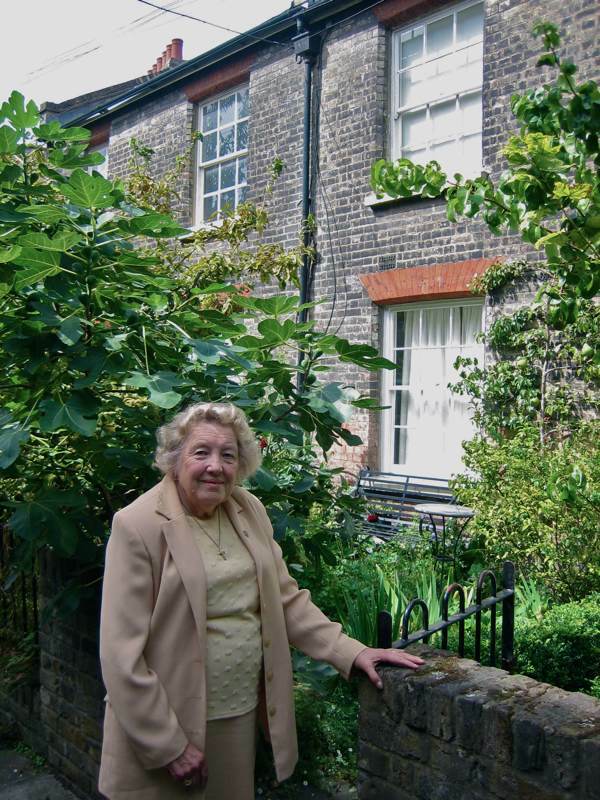 She still has vivid memories of these formative years in Spitalfields, even though she only came to live in the Dwellings at the age of six and left in 1940 at the age of fifteen when the bombing of London made it too risky to stay. This was a cause of great amusement to Mavis, who shrieked with girlish delight to confirm this unexpected recollection. “Yes, that’s right” she exclaimed in surprise, “My hair was was straight as die!” Yet all these years later, this conversation was evidence that Norah had taken notice of her mother’s instruction. “I can see you now coming down the stairs beside the pram,” she added, thinking back across time, on the occasion of meeting someone she had not seen in more than seventy years. 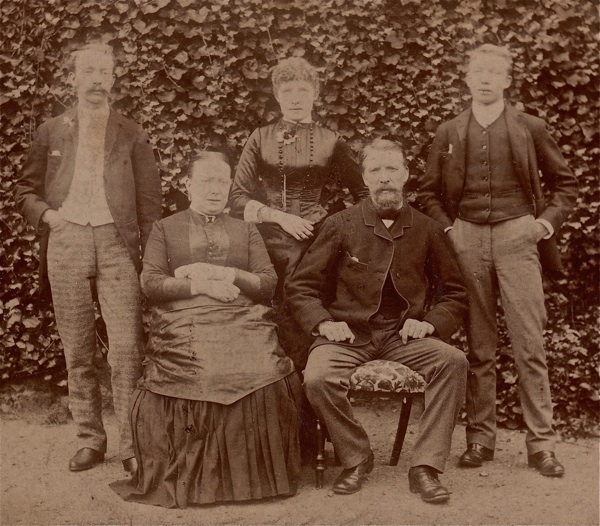 We all sat in a garden at Victoria Cottages and enjoyed a sunny morning chatting together, while Norah brought out her family photographs, which span dizzying amounts of time, and beguiled us with her account of her Spitalfields childhood. We moved into a flat in Albert Family Dwellings to be close to my grandmother – the family had been in Spitalfields since the 1840s. I went to All Saints School in Buxton St. Some of the children were quite poor. I had a friend whose father was a ganger – a roadworker – and if it rained he got no work and he had no money. Several children had parents who were builders, they couldn’t work in bad weather either. Some were railway people, and if they had big families they couldn’t manage. My friend’s family worked in the parcels office, they were comfortable, they even had a holiday because they got free travel. There was a lot of poverty because in 1931 all public service workers had a pound cut from their pay – a wage of three pounds and five shillings a week went down to two pounds and five shillings a week. It was a significant amount of money and people had to cut back. I wasn’t allowed to play outside. I was an only child and very protected, but I caught Scarlet Fever. I was taken to Homerton in the fever ambulance which was grey. My parents weren’t allowed to visit. They would bring a parcel each week and stand outside. The flat was sealed and the bedding taken away for fumigation, and my father had to have three days off work because it was so contagious. Then after six weeks, they said I had Nasal Diptheria and I had to stay another six weeks, so it was very harrowing for all of us. My mother cried when people asked how I was. When the war came, everyone was evacuated but, because I had been seriously ill, I pleaded with my parents to let me stay at home, and there was no school, so I had a heyday. I remember the bombing of the docks. On that day, I went on my own to Dalston on the bus to buy a skirt at Marks & Spencer. The air raid siren went at two o’clock and we were told to get off the bus and go to a shelter. Then, at four, I bought my skirt and walked back to Spitalfields. I wanted a pair of silk stockings to go with my skirt and in Hanbury St there was a little shop that sold everything. The owner was Noah Cohen, so I went to his shop and there was this little old lady and her daughter who was in her thirties. Noah let them go into the back to change and he told me their story. The girl had been in the bath when the air raid siren went and her mother called her to go to the Anderson shelter. The house was in Jamaica St and it got a direct hit, but they were saved by the shelter and all she had left was the dress she put on when she got out of the bath. Her mother had come to buy her a set of underwear to go a night shelter in a school, and he let her change into her new clothes. I often wondered what happened to that woman because a lot of the schools were hit. I went home and, by the time I got to the Cottages, I was running because I could smell the fires burning at the docks. And, as my mother opened the door, the people upstairs were coming down for safety. We sat in the doorway and my mother made tea while the bombs fell. The German planes made a particular noise. They got nearer and nearer and nearer, and you heard the bombs dropping, and you thought, “This is us,” and then they went over. The people in the building across the road all left, and they set their cats and dogs loose. We found a dog in the street and my mother called it “Victory “because she said, “We’re going to have victory! They can continue bombing but we won’t give in. They can do what they like.” We kept him for seven years and he died on 31st May 1946, on my twenty-first birthday, in his sleep. Today, the Albert Family Dwellings have long gone, demolished in 1975. Mavis Bullwinkle who lived in the Dwellings until the end and now lives a quarter a mile away, told me she had not been over to this area of Spitalfields for thirty years, “Because I miss them so much.” The pair of terraces named Victoria and Albert Cottages, and St Anne’s Church, are all that remain now of the world that Norah and Mavis knew in their childhood. Yet for a couple of hours it came alive again, as they sat in the garden and shared recollections of the two old ladies who ran the sweetshop across the road – gone more than half a century ago – the mission hall that moved to Bethnal Green in 1935, and of the teachers at Sir John Cass School where they were both pupils before the war. In contrast to the general assumption of poverty in the East End, Norah and Mavis’ history reveals a more complex social picture of people of different incomes living in close proximity. 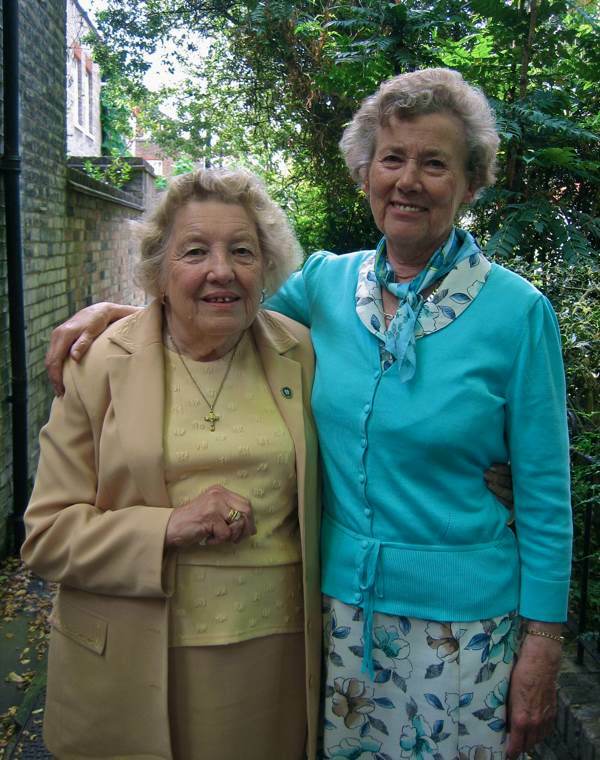 Norah and Mavis were also keen to emphasise the self-respecting ethic they grew up with.“They think we were all prostitutes and drunks, and we were dirty, but our working class morality was strong,” declared Mavis, turning passionate, “We didn’t think we were poor, we had enough to eat and we never wasted anything.” A statement which prompted the exchange of a glance of unity between the two women. Then it was time to say goodbye – once Norah Pam and Mavis Bullwinkle had swapped numbers, because a new friendship had been kindled that morning. Norah took one last glance at the gardens of Victoria Cottages, where her great-grandparents lived one hundred and fifty years ago, and looked up to the space in the sky where Albert Family Dwellings once stood. “I had a happy childhood here,” she said. Norah’s great uncle, Lewis Carr. He became a vaccination officer for Smallpox and lived on Cheshire St.
Norah’s grandmother, Louisa Ann Carr as a young woman. She worked at home sewing waistcoat buttons for Savile Row. 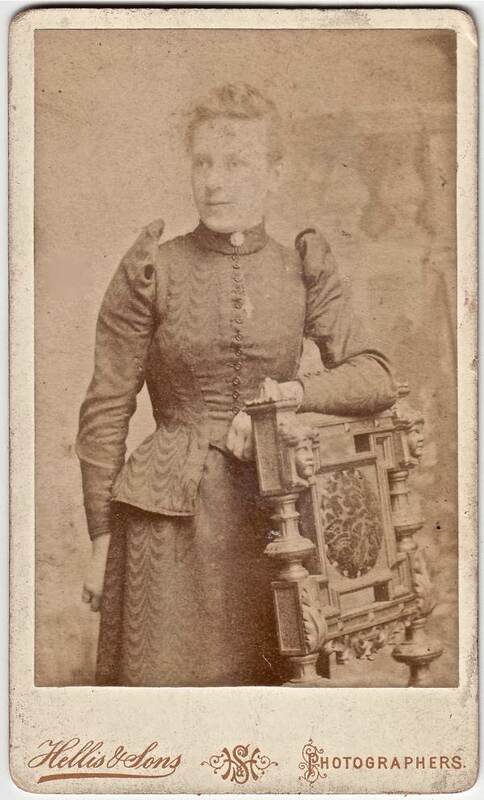 Norah’s grandmother, Louisa Ann, as an older woman at Albert Family Dwellings. Norah’s parents’ on their wedding day. 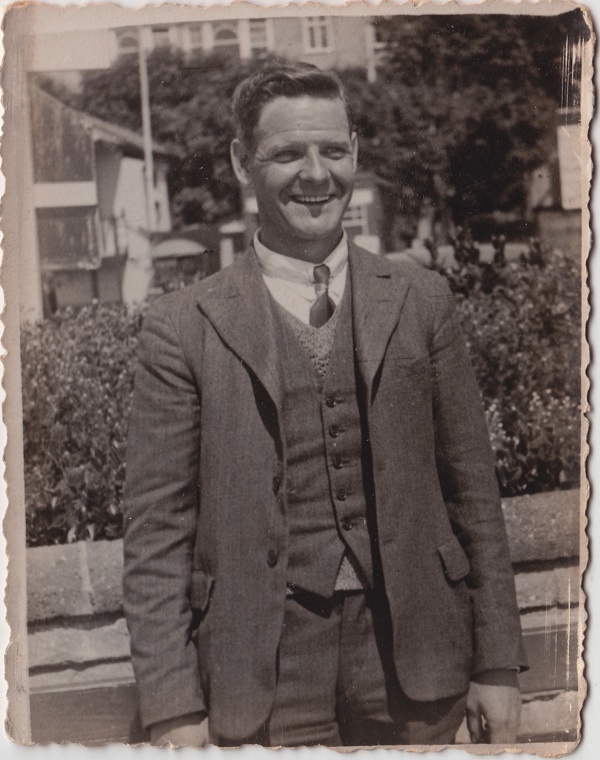 Norah’s father Edward Samuel Simmonds in 1939. 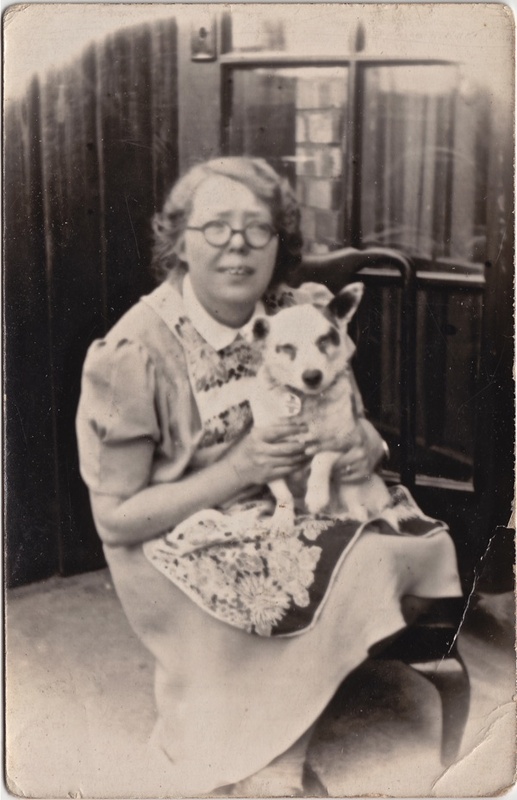 Norah’s mother, Violet Louisa Simmonds, with their dog Victory. 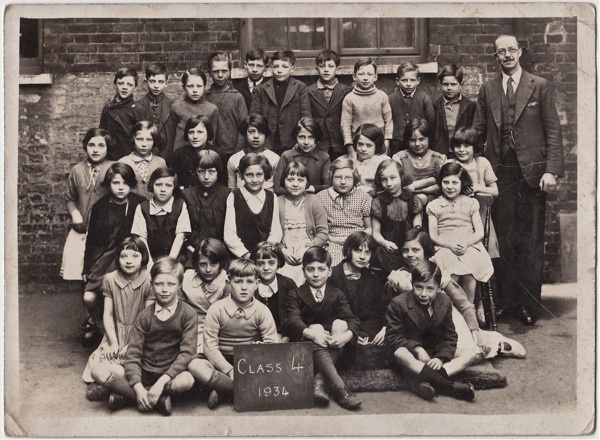 Norah’s class at All Saints’ School, Buxton St in 1934. Nine year old Norah is in the check dress with spectacles, third from the right in the first row seated on chairs. Norah’s glasses were from Mr Stutter, the optician in Bishopsgate. 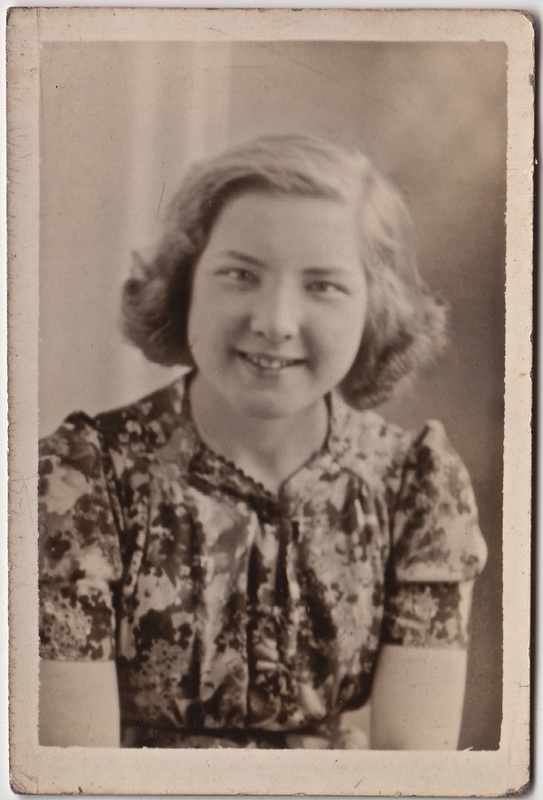 Norah in 1940, aged fifteen. 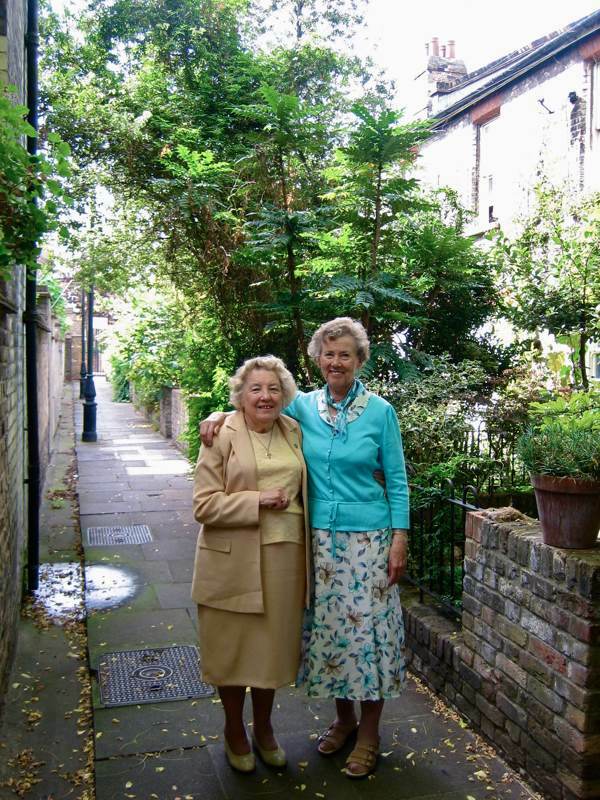 Norah and Mavis both grew up in the Albert Family Dwellings in Deal St that were demolished in 1975. 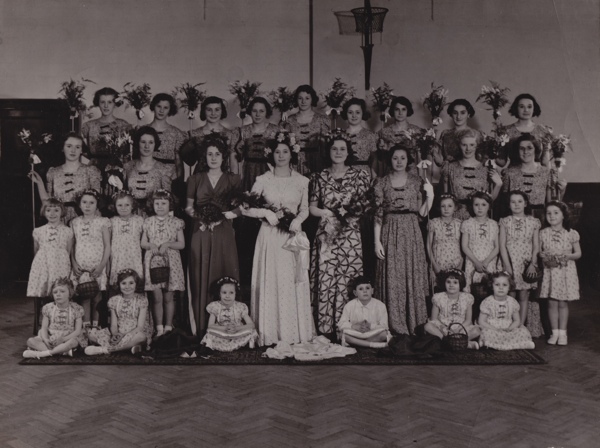 The last May Queen at Sir John Cass School in 1939, Mavis is third from the right in the front row of girls standing. 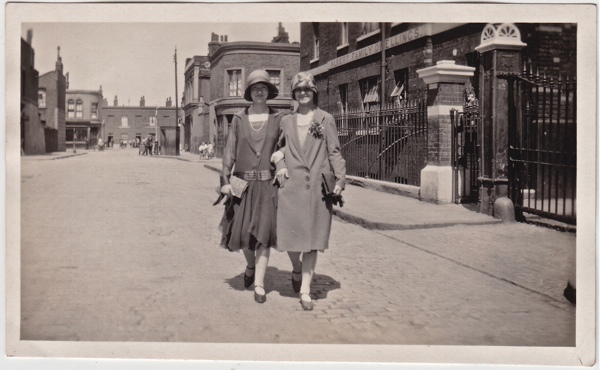 Mavis’ Aunt Ada and her mother Gwen in Deal St outside the Albert Family Dwellings in the 1920s. Norah Pam & Mavis Bullwinkle at Victoria Cottages. the last pic, with the little lane and the doughty affection — and victory! the rescued dog. too much. Wonderful how the past comes to life in your blogs. And to see that the East End is far more complex and interesting, than the cliche of slums and poverty we’ve always been fed. Congratulations on another warm, colourful piece of local history. And yay for Victory the dog! I found this wonderful piece very moving. We have so much more now than they did, but do we appreciate it? What a great story! Love the photographs at the end particularly and the stories about the bombing raids, I couldn’t begin to imagine what it must have felt like to live in those times. Also I agree with Jeannette, the photo with Victory is brilliant! Norah mentions that she was taken to “Homerton” – the isolation hospital- in the fever ambulance. The person to first institute this ambulance and who had seen the need for isolation of fever patients (T.B, Smallpox etc) even on the way to hospital was James Parkinson. 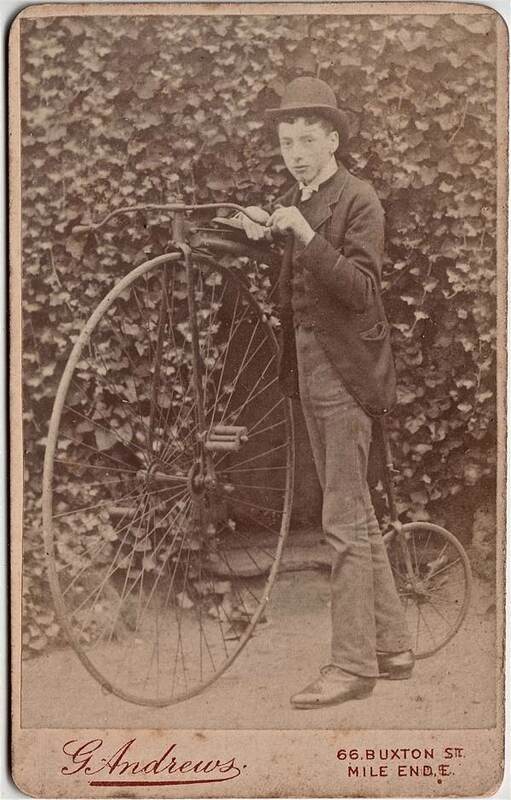 He lived in Hoxton Square and worked in St Leonards Workhouse, Shoreditch. In my view he probably saved more lives with the institution of the Fever Ambulance than with his essay on the Shaking Palsy and description of six people who had what has become known as Parkinsons Disease. Sadly to this day there is no cure, only symptomatic care for people with Parkinsons Disease. Spitalfields Life is a blog that never fails to delight and makes me wish I lived nearby. Your love of people & the fact that every life, however humble, contains a fascinating story shines out from all your posts. And talking of the bombing raids – my father and his friend, aged 16, travelled up to London by train from Reading during the Blitz – just for a lark. Teenagers – they never change ! Moving, touching, lyrical and real.Like Laurie Lee. Thank you for another evocative glimpse into the world of my ancestors. Norah is the same age as my mother, who spent the war in Hackney, not far away, with her parents and sister. 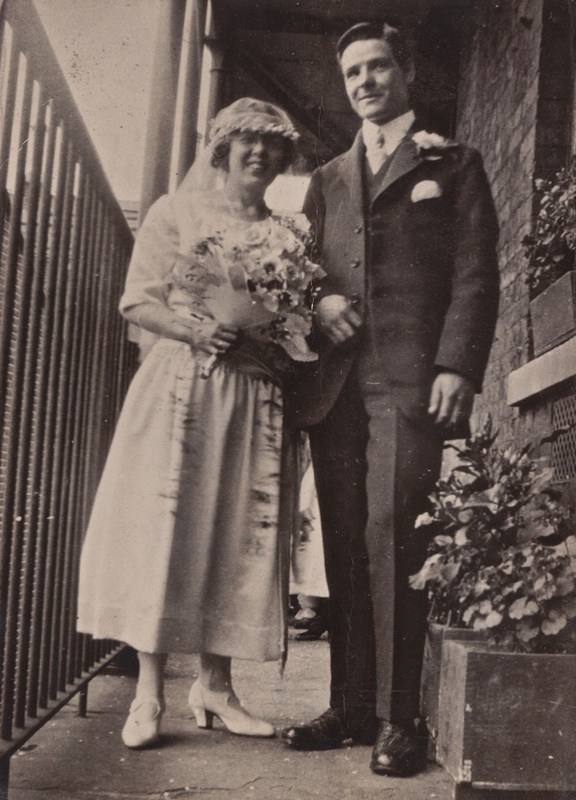 My father’s parents were married in 1917, in St Anne’s church, mentioned in your article. This was fascinating as Lewis Carr is my great great great grandfather. I have just read these memories. My mother and her brothers and sister grew up in Albert Buildings in the 1920s/30s. They would have known all the children in the All Saints School photo. The family name was Saunders. Thank you so much for the article.